Immerse yourself in the magic of winter as you make your way from Oslo to Helsinki. In 16 days explore Oslo and Bergen, go on an unforgettable cruise to the Lofoten Islands, cross the Arctic Circle and visit the Santa Claus residence in Lapland. Winter surprises don't stop here as you enjoy a reindeer sleigh ride, go dog sledding, stay at a Snow Hotel and in Glass Igloos. Following breakfast you meet your private guide at the hotel lobby and go on a 3-hour panoramic city tour around the most interesting Oslo attractions (no entrances included). All tickets and public transportation should be paid on the spot. During the tour you also visit one of the major Scandinavian treasures - the famous Frogner Park, informally known as the Vigeland Park named after its founder Gustav Vigeland (public transportation is included). You spend some great time strolling through this beautiful park and enjoying its extravagant sculptures and unique Scandinavian nature. In the morning after breakfast you check out from your hotel and walk to the train station (easily accessible by foot) to board a train that takes you to Bergen - the second largest city in Norway. 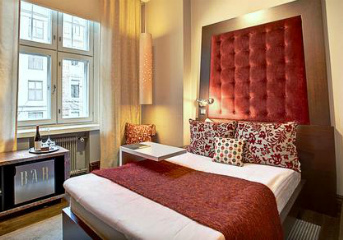 Upon arrival you walk to your hotel located very close to the train station. The rest of the day is free for you to do some independent sightseeing, dine in one of the local restaurants or just have a good rest. After the tour you have the rest of the day free. In the evening your driver transfers you to the pier to embark the Hurtigruten cruise ship that will take you to the voyage of a lifetime. Today your vessel arrives in the beautiful Art Nouveau town of Alesund. After a short stop you continue cruising. In the evening you reach Svolvaer - the picturesque capital of the Lofoten Islands. These islands are famous for their tiny fishing villages, unmatched Bohemian atmosphere and breathtaking natural attractions, including majestic granite cliffs and beautiful beaches. Later you reach the Gateway to the Arctic - the amazing city of Tromso. Take advantage of its beautiful surroundings and numerous restaurants and cafes to relax and spend time at your leisure. After brief early stops in Hammerfest and Havoysund you arrive in Honningsvag - the capital of the North Cape that is the northernmost point of mainland Europe. Spend the rest of the day at your leisure or join one of the unique optional tours. In Kirkenes you disembark the ship and your driver transfers you to the unique Snow Hotel, constructed entirely from snow and ice. The rest of the day is free. In the evening you enjoy dinner by the open fire at the Gabba Restaurant. After breakfast you check out from your hotel and your driver takes you to the authentic Inari region known as the center of Sami culture. Upon arrival you leave your luggage in the centrally located hotel. You meet your guide and walk to the Sami Museum. During the 1-hour guided tour of the museum you learn about the people and nature of Northern Lapland. You then have two additional hours to explore the interesting museum on your own or to have lunch (not included). In the afternoon your driver picks you up at the Sami Museum and transfers you to a remote location by Lake Muddus where you visit a local Sami Family. In 3 hours you are introduced to its reindeer herd, that you can pet and feed, while the hostess tells you about the importance of reindeer for Sami people. In the warmth of her house you find out about the fascinating process of creating traditional Sami fur boots of reindeer hide and learn what life is really like in the far north. After breakfast you check out from your hotel and continue your journey to new adventures. Your private driver transfers you to the Motherland of Santa Claus - Rovaniemi. This day starts with a 1-hour snowmobile safari to a reindeer farm where you meet traditionally dressed people, learn more about reindeer husbandry and Lappish culture and enjoy a short introductory reindeer sleigh and husky ride. After breakfast at your hotel, today you check-out and driver transfers you to the airport for your flight to Finnish capital. This is the last day of your amazing Scandinavian adventure! In the morning your private driver will take you to the airport for your flight home. We had a wonderful time - everything was arranged very well, and the weather and sites/activities were wonderful. Appreciate the help in putting together this trip for our family!